Niagara Falls, NY - Paden Berrigan of lewiston, 9, gets a new hairdo, compliments of a Van De graaff Generator, part of a birthday party for Nikola Tesla at Hyde Park. 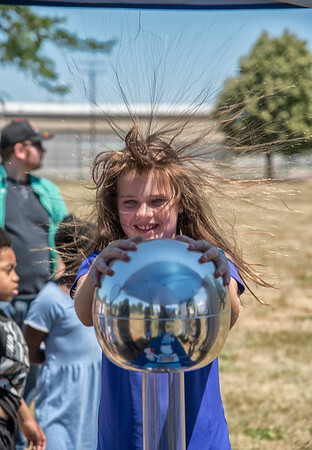 National Grid, Niagara Falls Community Development and the Niagara Falls City School District collaborated to bring Nikola Tesla’s S.T.E.A.M. Birthday Party to the city. July 3, 2018 - National Grid, Niagara Falls Community Development and the Niagara Falls City School District are collaborating to bring a new, family-friendly event to the heart of Niagara Falls, New York.